Did I say "next week"? Sorry, I meant "3 months". Actually life (plus a computer crash which cost me all my research) intervened. But we're back on track now. Here we go! We all commonly refer to the annual Transformers convention as "Botcon", but for a few years, due to legal reasons, it was called the Official Transformers Collectors Convention, or OTFCC for short. 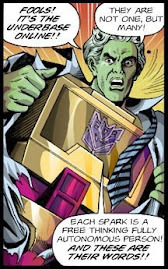 OTFCC had many grand designs when it came to exclusives, but financial difficulties resulted in the organizers losing the official Transformers license. That in turn resulted in many planned exclusives being left on the drawing board. Hot Spot/Defensor was the most ambitious of these which actually made it to prototype stage. The figure was a repaint and retool of "Robots in Disguise" Optimus Prime (known in Japan as "Car Robots" Fire Convoy). Repainted to look like the G1 Protectobot leader, the smaller robot would have been Hot Spot with the super Optimus Prime combined form being called Defensor. Hasbro later released a similar toy in their 6" Titanium line but it was not as impressive as this exclusive would have been. The rest of the planned OTFCC exclusives never made it to prototype stage, but concept drawings have surfaced. Devcon, the G1 cartoon bounty hunter, would have been created using the "Energon" Slugslinger mold, while the Wreckers' Roadbuster would have been reborn using the "Energon" Strongarm mold. A second use of the "Energon" Strongarm figure would have been a new version of G1 Brawn. Lastly, there was a new version of "Beast Wars" dragon Megatron using the "Robots in Disguise" Megatron 6-changer mold. The RiD Megatron would later be used as the convention exclusive Deathsaurus figure after the official convention was again reborn as Botcon. Also of note is the Wreckers catalog that was created for the 2001 Botcon. A variety of main line and convention exclusive toys made up the roster of the resurrected Wreckers team, but there were also a few figures that appeared only as hand-painted samples. 3H, the proprietors of Botcon at the time, had no plans to release these figures which included Transmetal Fractyl, Devcon and Alpha Trion. The entire Wreckers catalog can still be seen here. Not many unproduced "Beast Wars" prototypes have turned up, but there was an interesting set of concept drawings that surfaced. Among these are Transmetal versions of characters that did not get Transmetal (I) figures...Scorponok, Tigatron and Blackarachnia. There are also a couple of unproduced Fuzor characters, one of which looks like Optimus Primal as a griffin! 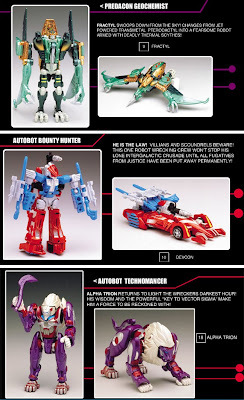 These look like they would have been great additions to the Beast Wars. One of the most recent Transformers lines, "Transformers Animated", has a tremendous fan following and there was much disappointment when it came to an end in the US. 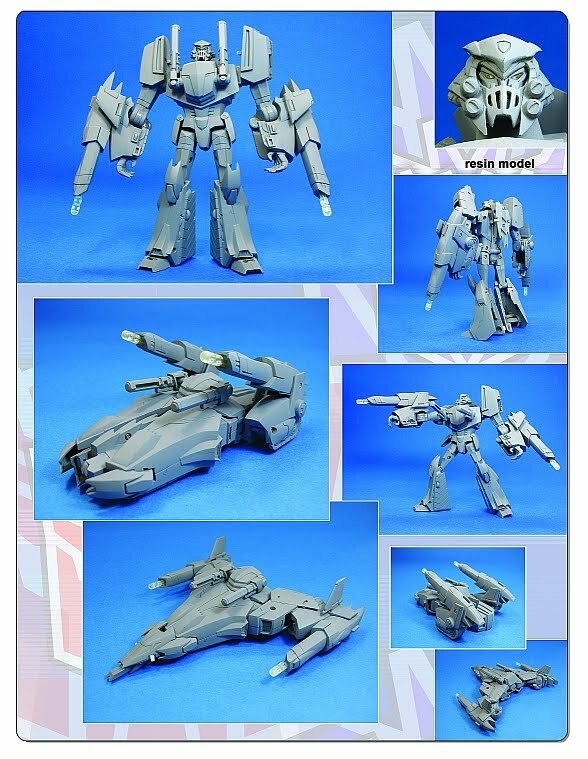 While most of the planned figures have made it to retail, this triple-changer Megatron prototype that recently surfaced is not planned for release. "Animated" fans hold out hope that Takara-Tomy will see fit to produce it as the "Transformers Animated" toys and series have just made their way to Japan. Thanks to The Allspark, TFW 2005, and Transformers Wiki for the pics and info. Back soon with more!